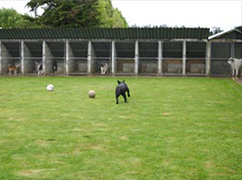 All kennels have a bedding area and is covered to protect dogs from the elements while still allowing them to see each other and the exercize area. This helps recent arrivals to acclimatise and gain confidence. All dogs are required to be fully vaccinated (Annual Kennel Cough Vaccination for Dogs is compulsory) and a Vet Certificate/ Booklet must accompany your pet on booking in. All vaccinations must be administered at least 72 hours prior to boarding. Please ensure you do not vaccinate your pet within 72 hours of coming in to board. Owners wishing to supply special diets are welcome to do so. As our saying goes - all pets will get cuddles and care! Dogs are exercised twice a day; in the mornings while their kennels are being cleaned and then again in the afternoon. They will always be given individual attention and depending on their social skills, will have other dogs to play with in small groups. To enable us to care for your pets, and for them to settle in to the routines, we require our hours to be followed strictly. Monday to Saturday 8am to 10am and 4pm to 6pm Sunday 4pm to 6pm only. If your dog is coming to us for the first time, we strongly recommend you bring him/her in the morning drop-off slot. This means he/she has the day to interact with us and feel comfortable about staying the night. We pride ourselves on the loving care aspect of our business and although we can not replace home, our aim is for every dog to have good time while staying with us. We will look after your pets the way we would want our own to be cared for.